For many travelers, just hearing the word Cancun conjures up images of loud, pulsing music, unlimited tequila shots, and throngs of half-naked college students burning off stress over Spring Break. Yes, during March and April every year, undergraduates migrate en masse to warmer weather with an unofficial invitation to the big party. But as students head back to campus to face finals and the end of another school term, Cancun readies itself for the influx of another group … families. Summer vacation in Cancun provides an array of activities from golfing to exploring the ancient ruins to fishing, snorkeling and every other water activity known. Granted, there’s a smorgasbord of activity offered in Cancun, but there’s also much to experience by doing absolutely nothing. Make footprints in the powdered-sugar sand stretching out like white carpeting, and listen to the waves swish in and out. Getting lost in a novel you’ve always wanted to read while sipping a tropical beverage topped with a tiny umbrella offers the perfect escape. Staring at words-can’t-describe-the-shade-of-blue water while reclined on a beach chair as the Caribbean breeze kisses your face can lower blood pressure quicker than medication. 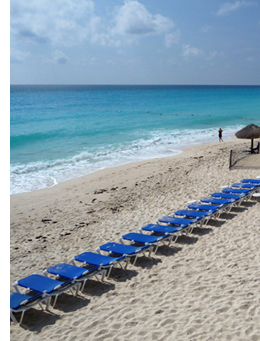 After the students of Spring Break and the families of summer have gone home, this is the Cancun you’ll encounter. September and October usher in lower rates, no crowds, peaceful quiet, and space to relax. If you do travel to Cancun between summer and fall, be sure to take out inexpensive travel insurance and check the weather for storm warnings the week before your planned departure. Since most of us live our Monday through Friday lives in overdrive, a “sit and just be” vacation might be the perfect prescription. 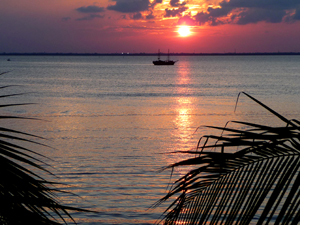 An escape to the quieter side of Cancun can definitely fill the order. You can find more information on visiting Cancun, activities, and more at Mexico’s Tourism Board. Kensington: The Girliest Palace in London!